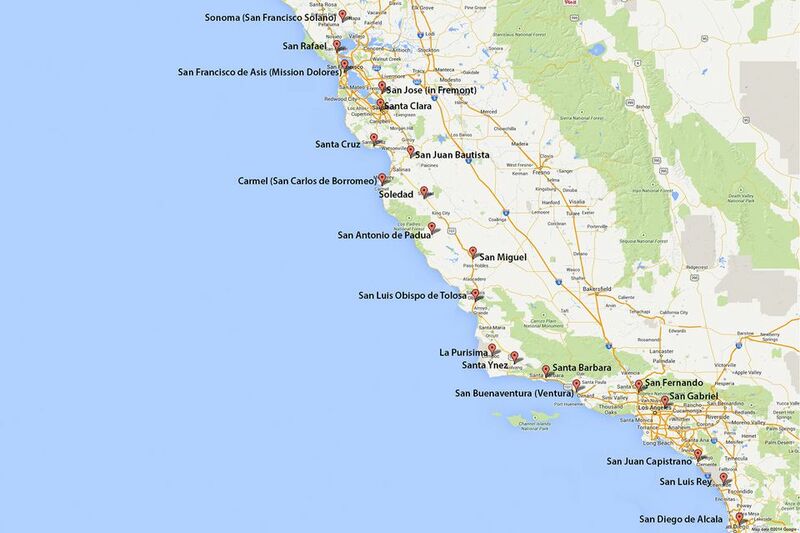 This map shows where all the missions are, but if you prefer a map that's interactive, with direct links to mission information - and where you can get driving directions, use the California Missions Map at Google. Carmel: Mission San Carlos de Borromeo looks more like missions in Texas than California. It was Father Serra's home mission and has an excellent museum. San Juan Bautista: Not only is the mission in San Juan Bautista mostly intact, but it faces a town square surrounded by businesses and buildings from the same era. Don't miss the animal paw prints in the church floor tiles — and the traces of the San Andreas Fault not far away. San Antonio: You'll have to take a detour from CA Highway 101 to visit Mission San Antonio de Padua. When you arrive, you'll be in the middle of a valley that is little changed since the mission era, giving an idea of what things were like in the 1700s. La Purisima: The best thing about La Purisima Concepcion is the way the state park has recreated the grounds. The building is also unique, and the layout is linear instead of arranged around a courtyard. Santa Barbara: The mission church at Santa Barbara is unique in its architecture, and they have an excellent museum. San Juan Capistrano: The beautiful but ruined church at San Juan Capistrano would have been the grandest of all the missions, but it was destroyed during an earthquake. The grounds are beautiful, too. San Diego: The most important thing about Mission San Diego de Alcala is that it was the first one in California, established seven years before the American Revolution began. Otherwise, it's not unique enough to merit a side trip. Between 1769 and 1823 — just 54 years — the Spanish Fathers founded 21 missions in what is now the state of California. When you are looking at a map of the Spanish missions in California, they seem evenly spaced, but it wasn't always that way. If you want to understand more about the mission period, it can be helpful to see the order in which they were founded. This map shows them with their year of founding. The numbers next to them indicate their order, from first to the twenty-first. The last mission founded was San Francisco Solano in the town of Sonoma, founded in 1823. Ten years later, all of the missions were closed. While it was an important part of California history, the mission period didn't last very long. After Mexico had won independence from Spain, the Mexican Congress freed all the Indians at the missions and made them eligible for Mexican citizenship. In August 1833 they secularized the missions, and by 1836, all of the missions were closed. Junipero Serra is known as the Father of the Missions. He was the head of the Spanish mission in California for many years, and he founded the first eight missions. Mission San Juan Capistrano was founded first by Father Lasuen, but it was abandoned and later refounded by Serra. He became Father-President of the missions after Father Serra. He founded nine missions during his 18-year tenure. Father Lasuen came to California in 1761.